10 Incredible U.S. Wineries That All Wine Enthusiasts Must Visit! As long as there have been humans, there have been a gifted few turning nature's bounty in the form of fruit into nature's elixir in the form of alcohol. Evidence of wine consumption has been found in Egypt, Greece, Rome and Turkey and in 2007 a discovery was made by archaeologists of a 6100-year-old winery in Armenia that included fermentation vats, a wine press and pottery storage jars. Shopping carts soon followed. Grapes were native to North America, but the kind cultivated in vineyards for wine production in the United States came from Europe. Americans didn't lose any time planting grapevines and the U.S. today ranks among the most-planted countries and is the fourth-largest wine producing country in the world. California bottles the majority of wine in the U.S., but wine lovers in all 50 states have found a way to coax vines from the ground to produce a crop worthy of pressing for friends, family or for public consumption. Pick a winery from among this list of wineries in the U.S.
Wine production in California accounts for more than 80% of the wine production in this country, so California naturally dominates the list of the best vineyards and wineries to visit. Napa is the name you may associate with wine in California, but Paso Robles is also Wine Country and one of the best wineries in the area is Tablas Creek, which is an organic estate vineyard that cultivates Rhine varietals. Their tasting room is open daily and you are welcome to picnic on their patio or reserve a seat at an intimate wine tasting session. Call ahead for a tour of the vineyard, nursery and winery tucked into the hilly, rugged terrain of west Paso Robles chosen for the limestone-rich soils and conditions similar to Chateauneuf du Pape in France. Grapes have been grown since the 1880s at Stags' Leap, sheltered by the Stags' Leap Palisades, and adding to the beauty and the resources available to the Stags' Leap working ranch. Wine growing is the focus now, but they will be happy to talk to you about the ranch and you can arrange for a tasting tour available by appointment only. Stags' Leap is one of the oldest wine estates in California and a tasting tour is made special by a look at the history of the area and the property and a walk through the gardens, including the "Winemaker's Apothecary Garden, which is a sensory map of plants whose fragrances relate to those found in the wines." At Becker Vineyards, they grow eight varietals on their 46 acres, including Sauvignon Blanc, Malbec, Syrah and Cabernet Franc and they recently won 27 Medals in the 2015 Lone Star International Wine Competition. Make a visit for a "guided tour conducted hourly on weekends" and call ahead if you are looking to score one of their used Oak barrels. The vineyard was a favorite with Lady Bird Johnson who appreciated the native wildflowers dotting the landscape. Summer visitors can relax on the outdoor patio and drink in the intoxicating fragrance of the thousands of lavender plants grown to be turned into products sold in their gift shop. If you make your visit in the spring, aim to drop in during their Lavender Festival (April 30-May 1). Walls Walla is fun to say and just as fun to visit, that is if your trip includes a wine tasting at L'Ecole in Lowden, Washington. The Tasting Room is tastefully situated in their 1915 schoolhouse and a guided walking tour that takes about an hour rewards your time with sips of six current release wines. Reservations are required and you can also reserve a private seated tasting in the cellar. L'Ecole has received a number of accolades for their wines and their winery, including being named winery of the year for 14 years in a row by Wine & Spirits magazine. Left Coast specializes in single vineyard wines, turning out Pinot Blanc, Pinot Noir and Chardonnay, among others. They maintain a commitment to the land and sustainability, made easy because they are owned and managed by one family, the Willamette Valley Estate. The vineyards span 300+ acres, and are situated in different quadrants surrounding a meadow and spring fed lake "central to the gravity-fed irrigation" of their vines. Their tasting room and cafe are open daily from noon to 5pm where their current tasting flight features six wines. Left Coast is also cultivating honey from "45 different hives of honey bees" and their honeycomb honey jars are available for sale. Take a few bottles of wine home and join their wine club for insider access to new releases, parties and special events. The state of Virginia is the fifth largest producer of wines in the U.S. and one of the places with the oldest vineyards, having been home to early European settlers who brought vines over on their cross-Atlantic journeys. Barboursville is a vineyard steeped in history and restored with attention to detail that offers elegant accommodations in their 1804 Inn & Cottages as well as fine dining in their restaurant. Join them for a "special feast," or drop by the Tuscan Tasting Room any day of the week to try one of the current vintages. Guided tours are offered on the weekends, but you can take yourself on a tour of what remains of the mansion and property Thomas Jefferson designed for James Barbour. The largest private residence in the United States is also a popular producer of wines whose "reds and whites have earned Gold medals for years." Make a reservation for a guided tour or spend some time shopping for a bottle or three to take home from "America's most visited winery" in the heart of Antler Hill Village. 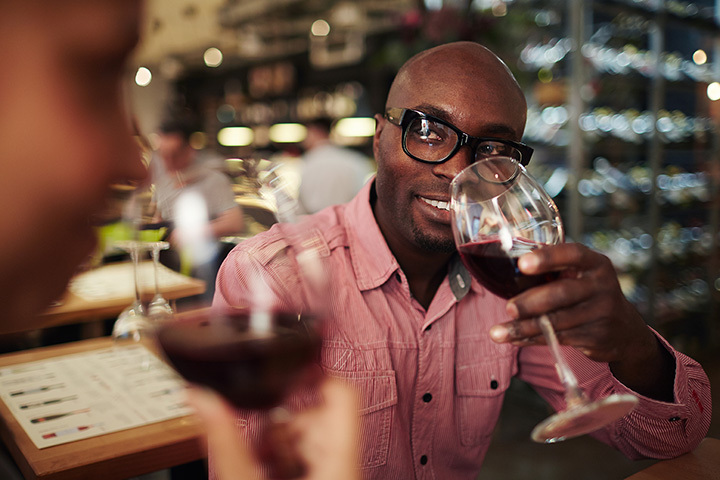 Sip and savor complimentary tastings and then saunter over to the wine bar where you can order your favorites by the glass while you nibble cheeses and locally made truffles. It is Biltmore, after all. Hermann J. Wiemer learned his craft in Germany and practiced it in the Finger Lakes region of New York where the cool climate and gravel soil proved ideal growing conditions for Riesling grapevines. Wiemer attended "Germany's premier winemaking and viticultural institutions" where he perfected his grafting skills and his first Riesling and Chardonnay vintages captured gold awards in New York. The 80 acres he purchased when he moved to the Finger Lakes in the 1960s are now home to the vineyards and winery that produce award-winning wines and keep the estate on the list of the top Riesling producers in the U.S.
Vermont may not come to mind when you think of wine, but the unique climate found on an island in the middle of Lake Champlain is responsible for the ice wine that can't be made anywhere else. Snow Farm Vineyard is Vermont's first vineyard and grape winery where the tasting room doubles as a concert venue. Join them for a Wine Down event, which is an "intimate evening of wine tastings, live music, food, art shows, laughter, family and friends." Become a regular customer for a surprise like a limited edition dry champagne called Bubbles on Snow "corked by hand and rotated carefully by wine maker Patrick Barrelet" made available for the holidays. The Gruet Winery is a family-owned and run winery that produces Pinot Noir and Chardonnay-based sparkling wines employing the Methode Champenoise. Gruet was founded in 1984 "with roots originating from Gilbert Gruet's Champagne house in Bethon, France." The warm days and cool nights as well as the dry, sandy soils of New Mexico add to the prominence of the region for wine growing. Gruet is acclaimed for their sparkling wines that are a favorite with sommeliers. Join them in their tasting room Friday, Saturday and Sunday or book a special event like a Waterways Cruise or Paint & Sip Night.